Evincing that the union of the BSO and its new Music Director continues to be happy and productive, Andris Nelsons commanded a powerful pair of 20th-century Russian works, both played and (sung) sumptuously and compellingly on Tuesday. Nelsons opened with Sergei Prokofiev’s Alexander Nevsky, Opus 78, Cantata for mixed chorus and orchestra, with mezzo-soprano, and a mighty sound it made. 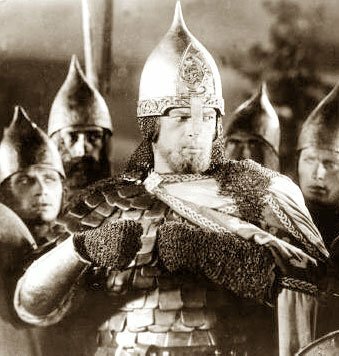 The cantata is a concert synthesis of the composer’s score for the 1938 film Alexander Nevsky, created, directed, photographed and edited by the great Russian filmmaker Sergei Eisenstein, who had achieved fame and notoriety with his silent epics The Battleship Potemkin (1925) with its famous “Odessa steps” sequence, and October (Ten Days that Shook the World) from 1928. And indeed, this is very impressive. The orchestra is quite large, with a particularly well-stocked percussion section. A tenor saxophone adds its unique tone at certain moments, in this performance soulfully and elegantly played by Associate Principal clarinetist Thomas Martin. Brass instruments are challenged by punishingly high tessiturae and difficult passages of rapid articulation. Odd effects of strings struck by the wood of the bow, glissandi, tremolandi pervade the string parts in extremely colorful scoring. Add to this a full-throated chorus declaiming the invincibility of Russia and a very rich and deeply flavored concoction is the bracing mix. Abetting this excursion was the elegant Nadezhda Serdyuk, whose rich voice was a perfect choice. She is one of those singers who owns the stage, so commanding was her demeanor. 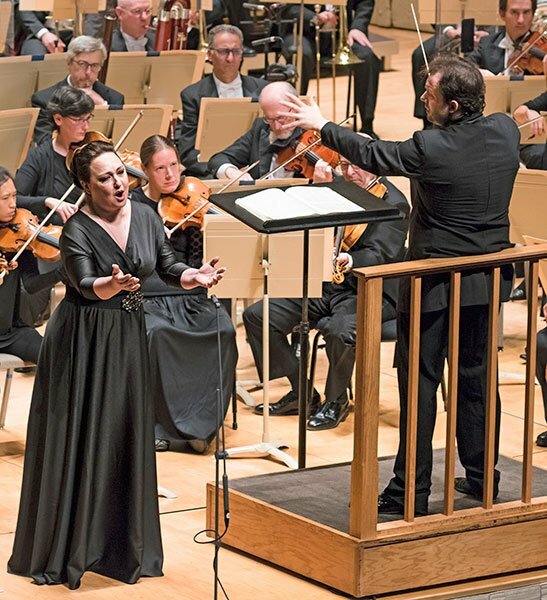 Her dramatic entrance during the gauzy ending of the cantata’s fifth movement brought her to Nelsons’s side just as the current section ended, allowing for no distracting interruption of the proceedings. As a fully equal partner, the Tanglewood Festival Chorus made its first appearance since the retirement of its founder John Oliver. A few interesting changes were apparent, not the least of which was the appearance of scores in the singers’ hand, a long-time no-no in TFC history. Rather than hamper the singers, it seemed to encourage them, and the clarity of their Russian diction, thoroughly coached by Lidiya Yankovskaya, was admirable. The chorus was prepared by James Bagwell, whose lengthy and impressive C.V. includes the helming of the Collegiate Chorale 2009-2015 plus many other instances of preparation of operatic and orchestral choruses . The bottom line was that the TFC sang with its usual fervor while projecting a particularly elegant blend within each section, no matter what the volume demands may have been. Nelsons propensity for forward-movement left little space for creation of atmosphere in the score’s more contemplative moments, which are few, but in other hands can be a very moving foil for the proud and bracing fortissimi that dominate. Impressive, indeed, were those fortissimi, though. There’s nothing quite like the BSO at full cry with the TFC adding its tonal luster to the occasion. While a certain weightiness was sacrificed by Nelsons’s streamlined approach, especially in the final pages of the score, other listeners may have preferred his pacing to that of, say, Stéphane Denève, whose Tanglewood performance in August of 2014 was overall a more impactful essay. Is Symphonic Dances Rachmaninoff’s finest work for orchestra? I would argue that it is, so brilliantly is it conceived and orchestrated, so redolent of all things Rachmaninoff, with the music of the Russian Orthodox Church and the Dies Irae so very powerfully in evidence. Yes, The Bells, and certainly The Isle of the Dead are also wonderful, but it is here, in what the composer called “my last spark,” that Rachmaninoff summoned his finest effort in orchestral color and virtuosic excitement. This reading by Nelsons and the BSO was simply the finest I have heard in concert, brimming over with fabulous playing and wonderfully supple and fiery conducting. Seemingly Nelsons was made to lead this work, so controlled and yet so wonderfully free was his marshaling of his willing instrumentalists, all of whom rose to the occasion with playing of the highest caliber. I’ll spare the reader the flood of superlatives that this performance surely deserved, but one player—Thomas Martin—must surely be mentioned again for his eloquent and golden-toned playing of the alto sax; his solo was repeatedly acknowledged by the conductor during the bravo-bedecked applause at the concert’s end. This concert will be repeated on Friday evening October 16th, and I urge anyone with a love of this superb Russian repertoire to attend.